Louis Berger has been awarded the ?109-crore (US$17-million) contract by the Maharashtra State Road Development Corporation (MSRDC) to provide project management services for the Versova-Bandra Sea Link (VBSL). Construction is estimated to cost ?6,000-crore (US$1.0-billion) and will take 54 months to complete. The VBSL, a northward extension of the existing Bandra-Worli Sea Link running along the western coast of the island of Mumbai, will be an eight-lane highway, approximately 10 kilometres (6.2 miles) in length, connecting the western suburbs of Versova and Bandra. 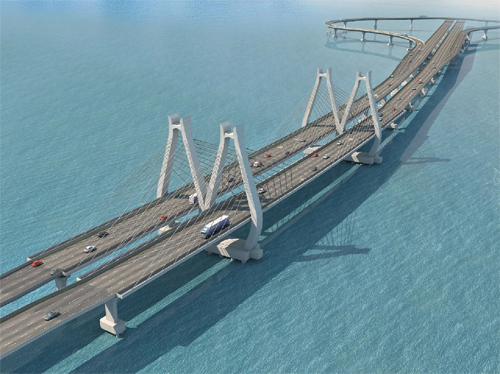 The main sea link will include a cable-stayed bridge section and a balanced-cantilever section for navigational purposes. It will also include two intermediate connectors, which will connect the sea link to the mainland and serve areas between Versova and Bandra, including Juhu and Koliwada. Louis Berger will provide services in three phases. The first phase will include the peer review of the previously-compiled techno-economic feasibility study and detailed project report (DPR), while the second phase will include compilation of tender documents for engineering, procurement and construction (EPC) of the project, as well as management of the bid process. The third and last phase will involve project and construction management services during the construction and defects liability periods, including review of the selected EPC contractor’s engineering designs. The project is slated for completion by late 2021. Photo Caption: Louis Berger will provide project management services for the Versova-Bandra Sea Link to be constructed in Mumbai, India. The eight-lane highway will provide a direct link between Versova and Bandra, and serve intermediate areas including Bandra, Juhu, Koliwada and Versova.